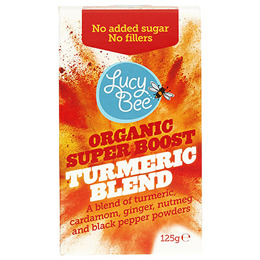 Lucy Bee`s Organic Super Boost Turmeric Blend is a warming blend of turmeric, cardamom, ginger, nutmeg and black pepper powders. Perfect for use in drinks and cooking. With no added sugars and no fillers, the Super Boost Turmeric Blend is naturally high in fibre, potassium, magnesium, iron and manganese. Organic Turmeric (57%), Organic Cardamom, Organic Ginger, Organic Nutmeg, Organic Black Pepper. Blend ¼ tsp. Super Boost Turmeric Blend is a warming blend of turmeric, cardamom, ginger, nutmeg and black pepper powders. Perfect for use in drinks and cooking. with pieces of mango, 4 pieces of pineapple and 125ml milk of your choice. Blend ¼ - 1 tsp. 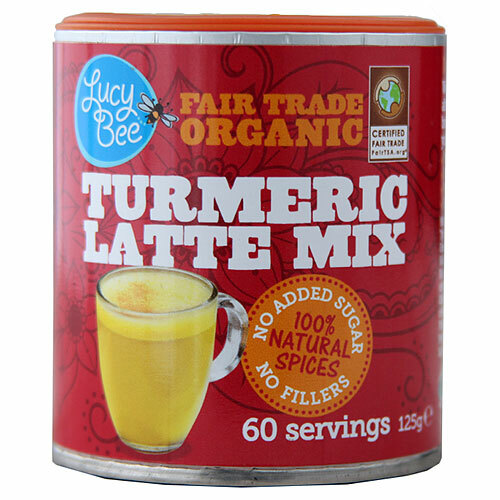 (to suit your taste) Super Boost Turmeric Blend with 250ml milk of your choice, plus optional sugar. Add to a saucepan and gently warm through to serve. For a tasty marinade for vegetables, tofu, fish & meat, blend 1 tsp. Super Boost Turmeric Blend with 1 tbsp. melted coconut oil, juice of ½ lemon and optional chilli flakes. Below are reviews of Lucy Bee Organic Super Boost Turmeric Blend - 125g by bodykind customers. If you have tried this product we'd love to hear what you think so please leave a review.